The Belgian Sheepdog emerged as a distinct dog breed in the late 1800’s in Belgium. Originally, the Belgian Tervuren, Malinois, and Sheepdog were all considered varieties of the Belgian Sheepdog. It was not until 1959 that the AKC registered them as separate breeds. The Belgian Sheepdog that we know today was known in the past as the Groenendael, so named for the kennel from which it originated. The Sheepdog was distinguished from its cousins by its black, thick coat consisting of long hair. The breed is known for its service during World War I as messengers and draft animals. They are currently in use as search and rescue dogs, guide dogs, and therapy dogs around the world. The Belgian Sheepdog is an extremely intelligent and intuitive breed. They are alert and attentive and are often used as watchdogs. They are affectionate with their owners, but also exhibit a strong protective instinct towards them. Belgian Sheepdogs excel in training. They are alert and responsive, and their intelligence allows them to quickly and easily learn new commands. They respond best to positive reinforcement dog training. Training and socialization should be started at a young age, as their strong protective instinct can lead to difficult situations with strangers. The Belgian Sheepdog is a high-energy breed. Owners will need to provide an outlet for that energy through vigorous daily exercise. Play, a long walk or jog, or an extended training session will all be helpful. Without daily exercise and attention, this breed can quickly become bored and frustrated. The Belgian Sheepdog usually lives between 12-14 years. 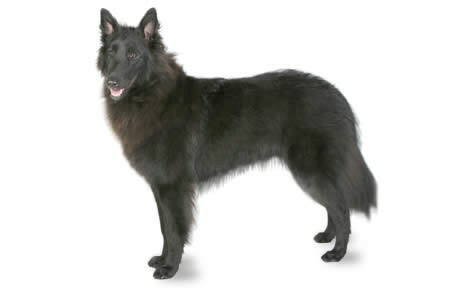 The Belgian Sheepdog is currently the 129th most popular AKC registered breed. This highly active breed will need a high-quality food source to keep their coat healthy and their energy levels up. Foods with a good mix of fats and proteins that avoid grain based fillers are recommended. The average Belgian Sheepdog weighs between 45-75 lbs., so feeding requirements will vary depending on their activity level and weight. Expect to feed your pup between 3 and 4 cups of dry food a day, split into two meals. The Belgian Sheepdog’s long, thick coat will require a vigorous weekly brushing with a slicker brush to avoid matting and remove excess hair. This breed will blow their coat in fall and spring, so expect to brush your dog more during these times. Are Belgian Sheepdogs Good With Kids? Belgian Sheepdogs are great with children, especially if they are raised alongside them and properly socialized. Because of their historical use shepherds, special care must be exercised to monitor their tendency to nip at the heels of running children. Epilepsy in dogs is a condition where dogs suffer from multiple seizures over time. These dog seizures are either categorized as idiopathic or symptomatic. Idiopathic epilepsy is the most common diagnosis and is a hereditary condition. Symptomatic epilepsy is a condition where seizures are a symptom of an underlying medical condition. In the former, seizures are usually managed through medication. In the latter, seizures are managed by treating the underlying medical condition. Hip dysplasia in dogs is a condition that commonly affects larger dog breeds, and is known to occur in Belgian Sheepdogs. This condition is caused by an improper fit between the femur and pelvis in the rear hip assembly. Over time, this improper fit causes the cartilage padding the bones to wear down unevenly, leading to painful arthritis, bone spurs, and eventually canine lameness in the rear legs. Hip dysplasia presents in young dogs as a looseness in the hip assembly. Elbow dysplasia in dogs is similar to hip dysplasia, except it affects the front legs. In elbow dysplasia, the fit between the radius and ulna is irregular. Unlike hip dysplasia, elbow dysplasia commonly presents at a very young age, typically during or soon after the puppy growth phase. An uneven gait, lameness following exercise, and slow recovery following exercise are all symptoms of elbow dysplasia. Additionally, these symptoms will progressively get worse over time. PRA is a hereditary condition that affects the photoreceptor cells of the retina. These cells are responsible for the ability to receive and perceive light. The earliest sign of PRA is a diminished capacity to distinguish objects in dim or low light, such as at dawn or dusk, or in a dimly lit room. As the capacity of the photoreceptor cells begins to diminish over time, these symptoms will progressively worsen until full loss of vision occurs. Because PRA is a congenital condition with no known treatment, it is strongly recommended to inquire with your breeder if PRA has ever occurred in any of your pups lines. Cataracts in dogs are a common condition that affects the eyes in many breeds. This condition affects the lens of the dog’s eye, resulting in a cloudy or occluded appearance. At early stages, there will be no diminished capacity of the eye. However, as the disease progresses it will lead to diminished vision and eventually full blindness. Cataracts can appear at any time during a dog’s lifespan, so be sure to incorporate checking your dog’s eyes for any signs of cataracts developing when doing your weekly grooming.